WHAT IS ACHILLES TENDINITIS LIKE? WHY DO I GET ACHILLES TENDINITIS? COULD IT BE SOMETHING OTHER THAN ACHILLES TENDINITIS? WHAT DO I DO ABOUT ACHILLES TENDINITIS? Marjorie may have been in her 60’s, but she had no time for the heel pain that had settled in her foot. She was an avid tennis player, went to pilates three times a week, and worked part-time in an apparel shop. She was 5’ 2” and so often wore high-heeled shoes. Afterall, who would buy clothing from some frumpy-looking midget? About three months ago, she started to notice pain in the back of the heel, mostly when she got up from bed in the morning. She also noticed a bump on the back of her heel. When did that pop up anyway? Well, she had one on the other side too, that she didn’t notice previously, so it couldn’t be dangerous. It was confusing however that these bumps only hurt on one side. Then itbegin to start hurting in the evening, especially after getting back from working at the shop until 6 PM. Now, the pain was nearly continuous and the swelling in the back of her heel was getting larger and reddened. She tried using flats, but that just made it worse. The anti-inflammatories helped a little, but were making her stomach hurt. The Achilles tendon is a band of tissue which runs along the back of the leg, from the muscle of the calf down to the heel bone or calcaneus. It allows the muscles of the calf, the gastrocnemius and the soleus, to pull on the heel and point the toe. Besides allowing you to come up on the tips of your toes, if you did not have this important muscle/tendon, you would be constantly falling forward as you walk. The strong ropey tendon however changes as it goes from the muscle and in he bone. 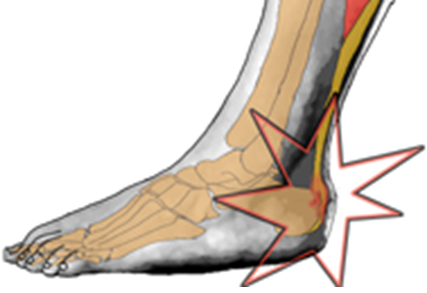 At its insertion onto the heel bone, it becomes stiffer and more like the bone on which it attaches. Even the cells within the tissue change from being fibrous cells to be more like bone cells. The blood circulation within the Achilles tendon is also rather unique. It comes in from both the heel bone and from the muscle belly. Because the tendon is approximately 5 inches long, there is an area in the center in which the blood supply is not quite adequate because the vessels did not quite reach it from either side. This represents a weak spot where nutrition is not able to sustain it well. The Achilles tendon is under a lot of stress and strain.The Achilles tendon bears your body weight with every step you take, and depending on your stride, speed, terrain and additional weight it carries or pushes, the tendon may be subjected to up to 12 times your body weight when you sprint or pushoff, especially with running or. A bone spur is a projection or point of bone in an area where the bone is usually smooth or round. Spurs can be seen in many different places. They can be located around the joints where they are usually the result of arthritis or healing within the ligaments from a previous sprain. Spurs can also perform around tendon insertions onto bone. As a matter of fact, they are extremely common there When the tendon is injured in any way even through normal wear and tear, a repair response will begin. The tissue near a tendon attachment has cells in it that may react much like bone cells. When those cells are told by the body to begin repairing, they will act very much like bone cells and react by laying down more bone, the same way that they might repair of fracture. This results in the appearance of calcification or bone within or around the tendon or fascia. A posterior heel spur, therefore, is not a diagnosis by itself. This is important because you should know that you do not have to have the heel spur removed in order for the pain to go away. Many people have heel spurs and do not even know it. Other people may have severe heel pain and yet on x-ray have no heel spurs. Even people that require surgery for Achilles tendinitis (less than 30% of people with Achilles tendinitis) can get a good result without removing the heel spur. Achilles tendinitis is deterioration of the Achilles tendon. The deterioration usually occurs in one of two places, at the insertion of the Achilles tendon on to the heel and in the midportion of the tendon right behind the ankle. Many people, even doctors, refer to this as “inflammation”. However, in the technical way, it is not really inflammation but tearing and scarring of the individual fibrils within the tendon. Unfortunately, because of its limited blood supply, the tendon is not heal as well as you would expect. If you cut your skin, the skin heals almost to normal within days. If you injure your tendon, often it takes a prolonged period of time to heal. Doctors and scientists have been looking into ways to make this heal faster, but have not found any yet. In some circumstances, Achilles tendinitis occurs from overusing the tendon or from sudden twisting injuries, such as an ankle sprain. This is more common in younger people. However, the majority of the time it is a degenerative condition, much like arthritis. Like arthritis, it occurs mainly because of age, a lifetime of activity, and your own individual genetic makeup. 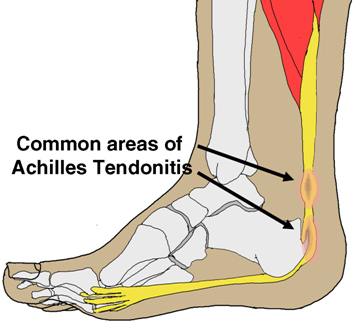 People who have a tight Achilles tendon seem to have Achilles tendinitis more frequently. Shoe wear may have an effect on this. Women who wear high-heeled shoes frequently may develop shortening of their Achilles tendon over long periods of time and this may add to the stress on the Achilles tendon. However, it is likely that this is a minor part of most cases of Achilles tendinitis. Athletic activity can increase the chance of Achilles tendinitis. Avid runners seem to have a 5 to 7% chance of developing Achilles tendinitis each year. This is in no way meant to discourage athletic activity, but runners should pay attention towards maintaining flexibility especially as they get older. Rarely, inflammatory conditions such as rheumatoid arthritis, scleroderma, and ankylosing spondylitis can cause or contribute to Achilles tendinitis. Usually, this is only suspected when multiple areas of tendinitis show up together. Achilles tendonitis is so common and characteristic that there are few other things that it resembles. Tendonitis of other tendons in the back of the heel. People with Achilles tendinitis can be broken down into three simple different degrees of severity. The least severe are those that have symptoms only occasionally (grade 1). If you have grade 1 Achilles tendinitis, you have symptoms only occasionally. You usually feel it only when you been sitting for a while. Many people have said with Achilles tendinitis, “the first step is the worst step”. The reason that it hurts when you stand up or when you get up after sleeping all night, is because the tissue around the Achilles Tendon has been allowed to relax. Muscles, ligaments and tendons contract slightly when tension is taken away from them, such as when your feet are allowed to flex to the floor. You cannot use the foot in this position. The sole of the foot has to essentially be at a 90° angle with the leg in order to walk very well. Getting the foot into this position requires pulling the muscles, ligaments, and tendons out to working length. After resting, pulling them out to this length requires extra force when compared to these tissues after they have been stretched out. You will feel that extra force as painful around injured tissue such as Achilles tendinitis. When you have grade 1 Achilles tendinitis, you can do most of the activities that you normally do, work, lift, run, and other athletic activities, but it may ache temporarily after these activities. Many people with Achilles tendinitis of this severity do not see a medical professional. A middle amount to severity is the grade 2 Achilles tendinitis. 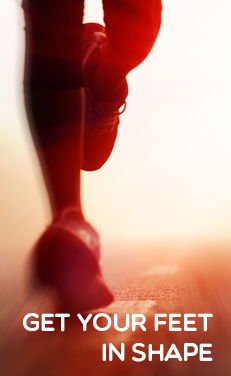 At this level, the Achilles tendinitis pain limits something that you can do. It may mean that you avoid physical activity, such as recreational walks, certain work activities, or personal activities such as shopping. The pain is appreciated to some degree all of the time, but it may be possible to do the activities that you need to do. Most people who have this degree of Achilles tendinitis will seek out help and began to actively treated it. Occasionally, Achilles tendinitis can get so severe that it makes any activity extremely painful. This is grade 3 Achilles tendinitis. At this degree, even everyday activities are difficult. People at this level may consider going to the emergency room for treatment. Often, they seek narcotic pain medication to help with the discomfort. People at this severity require help to do everyday activities and are potentially unable to do many work activities. Reducing activities that might aggravate Achilles tendinitis is an important part of treatment. In most cases, this does not mean that you will have to completely stop doing your normal everyday activity, but certain activities, especially the ones that cause considerable strain to the heel, such as prolonged standing, running, and jumping, may have to be decreased in order to key of the Achilles Tendon a rest. If you are a runner, this means that you should switch to other aerobic activities or decreased your mileage temporarily until the pain allows you to resume them gradually. A prefabricated heel wedge can be inserted into the shoe to relax the Achilles musculature and reposition the foot during gait. If there is a specific foot abnormality such as flat or high-arched foot, a prefabricated or, rarely, custom arch support may be helpful. Doing exercises/physical therapy. There are a couple of things to keep in mind when looking for comfortable shoes when you have Achilles tendinitis. The first is that the tendon, especially in insertional Achilles tendinitis, can be pretty tender to the touch. Shoes that have a heel counter, the portion of the shoe that goes around the back of the heel, that is soft or shoes without a heel counter can be very helpful. If there is movement about the heel, this can also aggravate it. The second is that using a shoe with a slight incline or elevation of the heel can relax in Achilles tendon and decrease the pressure between the underlying bone and the Achilles tendon. Examples that might fit both of these would be certain padded running shoes, a backless clog or sandal, or backless pump. Much research has been done to evaluate the types of strengthening exercises that help Achilles tendonitis. Several studies have shown eccentric exercises to be specifically helpful for this condition. In this type of exercise, the tendon and associated muscles are worked at high resistance to the point of pain. An experienced therapist can teach and supervise these exercises to avoid greatly aggravating the injury. Enlisting the help of a competent, enthusiastic physical therapist can help in many ways. The coaching and encouragement of a physical therapist can improve motivation and improve the outlook. In addition, specific adjustments can be made to the rehabilitation routine in order to minimize any aggravation that the exercises may be causing. The modalities such as ultrasound, phonophoresis and contrast baths are often added, but limited evidence exists to prove their long-term effectiveness. Anecdotally, it is our feeling that they give temporary relief that still may be of benefit on the road to rehabilitation. Pain medications including acetaminophen (Tylenol) or anti-inflammatory medications (e.g. Motrin or Aleve) can be effective ways of helping control pain, but it should be realized that these medications most likely do very little to actually cure Achilles tendinitis. The benefit of taking these medications is for their ability to help with pain and little else. If they do not significantly decreased pain, there is probably very little benefit to taking them. In addition, all these medications have significant side effects that may make them dangerous if taken over a long period of time. Some of them have even been taken off the market because of concerns that they may increase the possibility of heart attack. Even the over-the-counter brands of anti-inflammatories may have this risk. It is fairly common for blood pressure to be more difficult to control when these medications are taken. Anti-inflammatories may interfere with the benefits of taking low-dose aspirin for cardiovascular problems. Steroid injection in the treatment of Achilles tendonitis is very controversial. Our recommendation is to avoid steroid injections in the treatment of Achilles tendonitis. More than half of the ruptures of the insertion of the Achilles tendon that we have seen in practice have occurred after steroid injection. These medications inhibit the metabolism of the tissue. The use of steroid injections is discouraged around weight bearing tendons such as the Achilles tendon because of this significant incidence of rupture. Most studies have found limited evidence that platelet rich plasma or PRP is helpful in the treatment of Achilles tendinitis. braces work by limiting the motion of the Achilles tendon and therefore resting it. This can have a pain reducing effect on the tendon, but it is unclear whether this leads to healing. A brace is helpful in some cases of Achilles tendonitis. It works by limiting ankle motion and to some extent by applying counter pressure to the tension within the Achilles tendon. Many braces also reduce the motion of the foot and thus the work that the Achilles is required to do. These can all have beneficial effects on a healing tendon. All braces to some extent sacrifice freedom of motion, and fit within the shoe for increased stability and protection of the damaged structure. On the lighter end of this spectrum, an elastic ankle sleeve is light and minimally cumbersome, but not very supportive. On the heavier end, an AFO (an abbreviation for ankle-foot-orthosis) is a rigid usually plastic shell that restricts motion considerably. This brace is sometimes uncomfortable especially if it does not fit properly. It can be difficult to fit in shoes unless they are very loose, and it is more expensive, especially if it is a custom brace. The right brace is the one that give the most relief with the fewest disadvantages. To some extent, your physician or therapist may be able to guide you. Some trial and error may be necessary to find this balance. In severe cases, a period of immobilization is recommended. Applying a short-leg walking cast to the leg, extending from the end of the toes to the upper shin, can drastically reduce the stress on the Achilles tendon. This is worn for three to six weeks. A prefabricated cast boot is not nearly as effective, because it is far too easy to begin to remove to a lesser but usually greater degree. The effectiveness of cast immobilization at lessening the amount of pain from Achilles tendonitis is quite good, however, immediate complete resolution of the pain during this relatively short period of casting is uncommon. Minimally invasive procedures (coblation, ESWL/Orthotripsy )– None of these treatments has definitely been shown to be helpful for this problem. Surgical procedures – Surgical treatment is directed toward removal of the damaged tendon and any calcaneal bone pressing on the tendon and repair of the Achilles tendon. This includes any spurring within the tendon. Occasionally, in situations where the tendon damage is severe, the flexor tendon to the big toe can be used to reinforce the tendon repair. This sacrifices some amount of toe strength. This is usually well tolerated. After the surgery, the leg is restricted in weight bearing for up to four weeks. Good results are found in 70-80% of cases but may take up to one year to fully recover from the surgery. Complications include rupture of the repair, wound healing problems, and continued local pain. // Learn More about Achilles Tendinitis! Platelet Rich Plasma and Achilles Tendinitis.